It’s been almost four months since we announced The Settlers at gamescom in Cologne. And wow, some really busy and exciting 4 months these have been. With the year coming to an end we want to use this opportunity to recap what has happened so far and give a small glimpse at what’s coming next year. 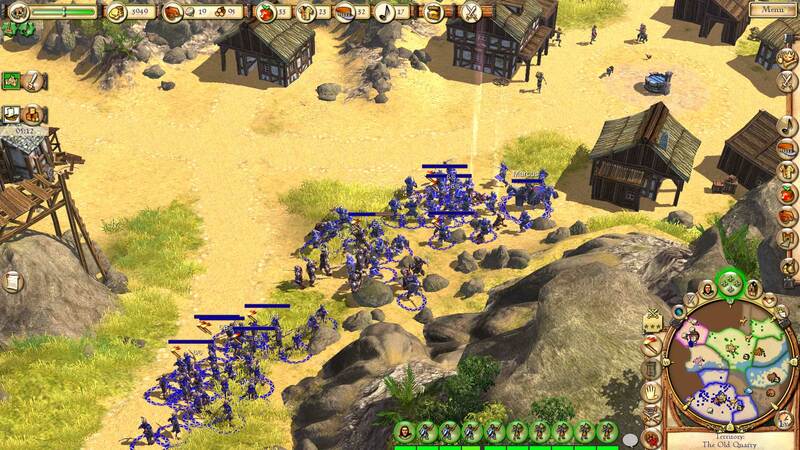 The 21st of August, the big day: The Settlers creator Volker Wertich and Blue Byte Managing Director Benedikt Grindel not only announce the re-release of The Settlers 1-7, celebrating the series 25th anniversary, they also revealed something completely unexpected: A new The Settlers game. And for everyone attending gamescom we presented the first live gameplay of an early alpha version in a hands-off presentation at the Ubisoft Business Center and in the Ubisoft Lounge. Together with the announcements we launched the The Settlers Alliance, that’s…well, the place you’re reading this right now. We started by providing some first info about the new The Settlers and about the The Settlers History Editions which released on the 15th of November. What makes a The Settlers game a The Settlers game? One of these key elements we identified was “WYSIWYG”: Everything that happens in the game is visualized. This for example means you can watch a tree’s life-cycle from start to finish, from a growing sapling to processed planks. The goal of WYSIWYG is for players to be able to understand, without indicators, what the game is about. Since the very first The Settlers, logistics have been a central aspect with great importance to your economy. 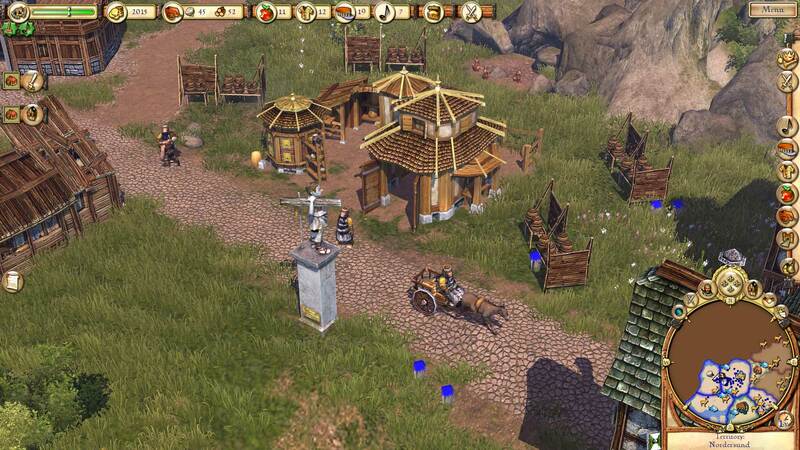 In the new The Settlers you’ll start with carriers taking care of transporting goods even without roads. But building them will speed up your carriers, while higher level roads will also enable you to use vehicles. Pull, donkey and ox carts can carry multiple goods at once and will be vital later on to ensure a smoothly running economy and timely deliveries. Your settlers will then get all required goods for a meal from the market place and go back home, to cook a tasty dish they deliver to the workers. Higher quality meals require more ingredients but also provide more stamina to your workers, meaning they can work for longer without another break. From September on we posted small teasers about different game mechanics together with some screenshots. In November, leading up to the release of the History Collection we provided you with some (fun) facts about the previous The Settlers titles. Now it’s December and our Christmas event is already running for a while. There’re just 5 days left, so make sure to check it out before it’s too late. And let’s not forget: Our community updates! These articles are focused on you, the community: We’re highlighting content creators who are streaming the The Settlers games, creating videos about them, creating cool new maps or organise something like the Fan Discord “Settlers Wuselworld”. In addition we update you on new events and feature interviews with guys like Keralis, a YouTuber with a focus on strategy, management and build-up games – more to come! This means: If you’re working on any kind of content involving The Settlers, be it videos, streams, fanart, maps or cosplay (is there The Settlers cosplay? If not, this is your chance!) 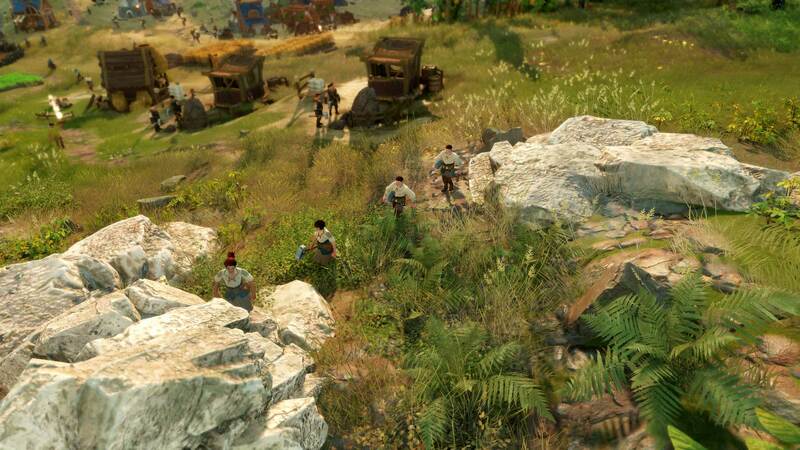 send us an email at thesettlers-community@ubisoft.com to get featured in a future blog. The release of the The Settlers History Editions on November 15th! Thanks to all your feedback following the release, we have also been able to iron out a few issues and overall smoothen the The Settlers experience for everyone. We’re not done yet and still got a few things we’re working on – especially to make the still active multiplayer community all-around happy. After a nostalgia-themed November we focused on the new The Settlers again – and on a rather important topic: Your Settlers population. To get new Settlers you will have to build a harbor. Your harbormaster will then sail out to unknown lands and look for new settlers willing to join you. A prosperous settlement will be able to produce special goods like coins which are used to convince people to join you. After arriving at your settlement they take up different jobs like worker, carrier and soldier, distinguishable by their coloured vests. Direct Actions are a new feature in The Settlers allowing you to temporarily boost your production or help you overcome bottlenecks in your economy until you’ve solved the problem. If your carriers are idle for a while they will accumulate motivation points. These can be used for Direct Actions: Sending a few of your idle carriers to chop down trees, collect some berries or mine some coal. Additionally you can send them to production buildings like the carpenter, to help out for a while which speeds up the production of bows. Well, this was 2018 for The Settlers. Those were some really exciting months for us and we’re extremely happy to have received such positive feedback from all of you during this time. We know there are a lot of things you’re curious about, a lot of unanswered questions, but be assured we’ll have a lot more to share in 2019: More gameplay videos, details regarding the military and…playtests? Thank you all for the great support and stay tuned for more. In the meantime, make sure to not miss out on the last days of our Christmas event over on Facebook, there’re only 5 days to go! As you might imagine the The Settlers team is taking a break over the holidays, celebrating with friends and family and just getting some needed rest. We’ll be back for you in early January with more details on what to expect in 2019. Fixed an issue with auto save. The game will now auto save – if enabled in the config menu – in Multiplayer, Singleplayer: Scenario and Campaign. Today we want to look at the last part of the History Collection: The Settlers 7! 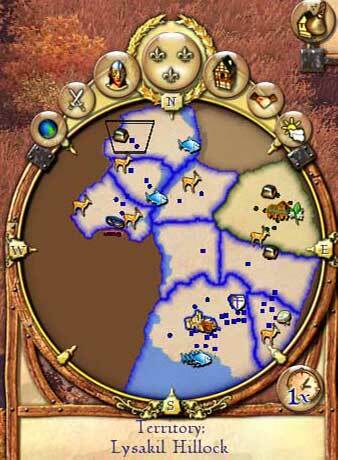 This part features much more complex economic cycles than the previous two The Settlers games and brings a pinch of innovation using sectors and victory points to the The Settlers world. The map “River town” is great for a particularly easy start – in addition to the campaign. Choose the AI “Countrybumpkin Rupert” with “Easy” level for an easy start. As you will see, you already have two sectors at the beginning. This solves the lack of space problem for a while, something with which one always has to fight in The Settlers 7. We now begin with the classic start strategy in the first sector, constructing a lodge, to which we attach a woodcutter, a forester and a sawmill. A second lodge is needed to build a hunter. More than one hunter would be too much for the small amount of wild animals in the starting sector. Now set the food in the hunter’s lodge to “fancy food” – more to that topic later in the expert tip at the end of this guide. Tip: Once you raised these buildings, it is advisable to set the work area for both the forester and the hunter so that they know where to work. Next, you should build a mountain shelter with three quarries at the stone deposit. In contrast to the hunter you cannot build too many miners – the more you build the more you get. To make use of the goods from the hunter, build your first noble residence to which you attach two butchers and provide them with “fancy food”. Below your castle is an idyllic riverbank with fishing grounds. We would like to use this but first need to construct a way there. Since the road to the water is very long, you should build a storehouse midway. Between them walk carriers, who frequently take the goods from one storehouse and bring them to the next. However, a storehouse always houses multiple carriers (and can be upgraded later), so you need significantly less of them. Tip: In order to ensure an efficient economy, you should always build storehouses in the middle of a sector and on the borders between the sectors. In particularly large sectors, more storehouses may be required. Afterwards you can build a lodge with three fishers at the fishing grounds. In order to get the bread production going as well, you need 1-2 grain barns (they need a lot of space for the fields! ), a windmill and a bakery. 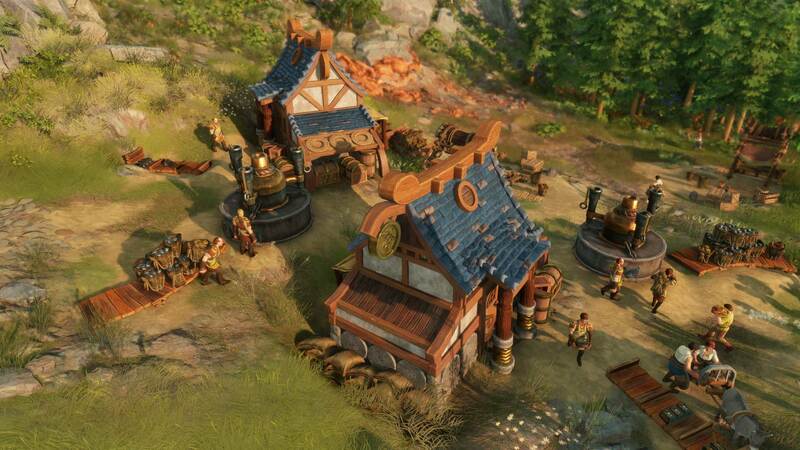 With the help of “prestige” you can unlock new buildings in The Settlers 7. For the next prestige level you are missing two prestige points at the beginning of the game. Build two large prestige objects (they only need stones) and you can unlock your first prestige option. As reward you should choose the option to unlock the stronghold, export office and church now. This decision essentially determines which economic branch you have to focus on in the following game! In this guide we decide in favor of the church and build it at a place where we have plenty of space (!). The second of your two sectors works best here. So, why do we need so much space? You can add prestige extensions to the three special buildings and they are much cheaper than the normal prestige objects – but they need a lot of space. You have 10 coins at the beginning. You can use these to recruit soldiers without having any barracks. Hire two pikemen and one musketeer in the tavern and assign them to your general. Remember to use geologists in the mines later to revive depleted deposits! First, use the raw materials for the construction of tools. You should set the toolmaker’s working option to “On Demand”. Otherwise, you will soon have a tool overproduction and take away the resources from the blacksmith. For the construction of soldiers, you need weapons and gold. Later, horses and wheels become important. 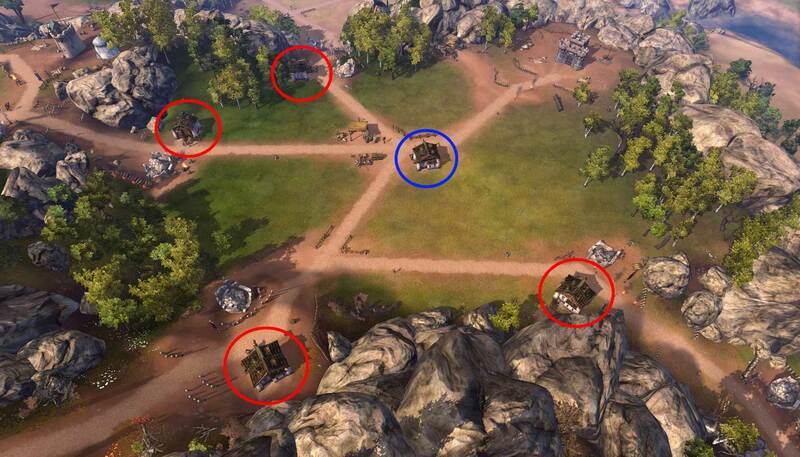 Pay attention to whether a sector is defended by towers before capturing it. If you explore the technology of espionage with the help of your priests, you can inspect the opposing units. If you use military, you should hire a stronger general in the tavern as soon as possible and assign the soldiers to him. You can take all neutral sectors even without military power. 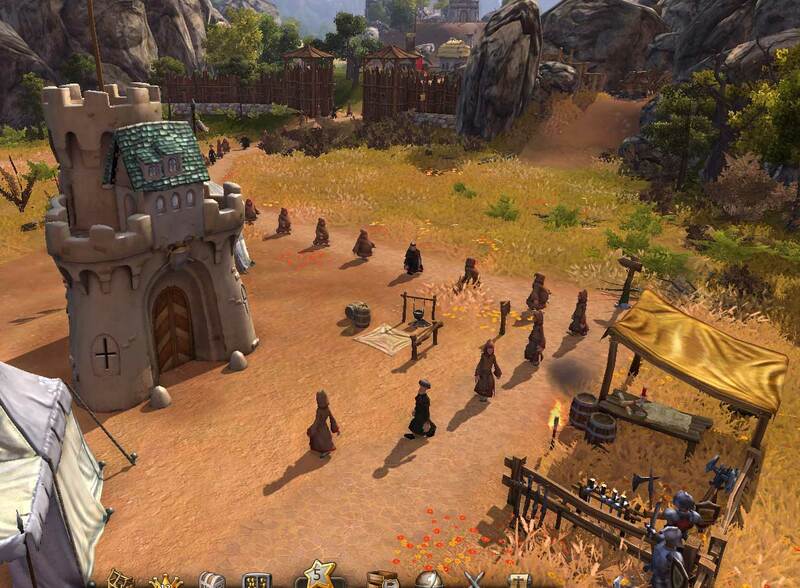 Send either monks or merchants, depending on which path you chose before. A perfect economy in Settler 7 means to count! 3x meat (out) – 1x sausage (in) => 3x2x sausage (out) – 3x sausage (in) => Every cycle +2 sausages! Thank you to haep for creating this fantastic guide! For other production buildings (piggery, windmill, bakers, etc.) the perfect constellation, however, usually looks very different. Therefore, if you have any questions, feel free to contact our The Settlers veterans in the forum or on Discord. And if you ARE a veteran and want to share some tips or strategies, feel free to leave those in the comment section below, on the forums or over on Discord. Last week we talked about the population system and how you get new settlers. Sometimes those settlers are not busy and this is where Direct Actions come into place – another new feature in the new The Settlers game. Please keep in mind that this feature is in an early stage, we are experimenting with it and there may be changes in the future. Direct Actions are initiated by the player to temporarily boost production buildings or resource gathering. In order to execute Direct Actions we will need an idle carrier and motivation points. How do we get Motivation Points? In a perfect The Settlers world all of your carriers are busy and have something to do. But reality is sometimes different. You probably have carriers who are idle and waiting for their next task. While they rest those idle carriers will generate motivation points automatically. These motivation points are an extra reserve, which can be used at any point needed. If we have idle carriers and motivation points, we can perform Direct Actions to boost our economy. There are multiple ways to do so. How to perform Direct Actions? Direct Actions can be performed on forest areas, copper, stone or coal deposits or any other area where you can harvest / mine goods. Simply click on the resource you want to gather and execute the Direct Actions. Every Direct Action will use one motivation point and requires one idle carrier. You are low on wood? Simply click on your forest and let you carriers help your woodcutters by chopping down more trees. Forgot to build a gatherer hut and your workers are hungry? Send your carriers to collect some berries. As long as you have enough motivation points and free carriers you can send them to do those extra little tasks for you. By using Direct Actions you can avoid bottlenecks or ensure your production chains have additional goods. You can also temporarily boost your productions by using Direct Actions. Since the production of a good is divided into several stages, you can simply send carriers to help the craftsmen working at the buildings! As an example let’s take a look at the smelter. The production is divided into several phases. One worker uses the coal to heat up the furnace and his/her colleague adds iron ore. Once this step has been completed they will make their way over to the mould. One will put the hot iron bar into the cold water, while the other one waits until it is cold enough to put it on the output pile. If you now want to boost your production, you send your carriers over to help with the smelting process temporarily with the help Direct Actions. Since they are not trained for the main job, they will only handle the transportation phases. Meaning: They will carry the coal and iron ore to the furnace and transport the iron bar to the output pile. This makes the whole production more efficient and faster. Each building has a different number of additional carriers who are able to help if you boost your production with Direct Actions. It is completely up to you (and of course the number of Motivation Points and idle carriers available at this time) how many carriers should help up to the allowed maximum of the specific building in this process. How will you use your idle carriers? Temporarily boosting your production or gathering resources? What do you think about the system? We are also considering other ways to use direct actions in the game, do you have any ideas about that too? Let us know in the comments below. If you recently bought the History Collection or are just generally playing with the thought of trying out The Settlers 6 – Rise of an Empire, we got just the right guide for you! Read on to get a brief overview over the game and a few tips to get started. You will notice several differences to previous games which will require a different approach to creating a prosperous settlement. You will not only need basic building materials like wood and stone but also a regular supply of food for all your settlers, no matter the profession. Your people have various additional needs like clothes, cleaning supplies or entertainment. Only if these are fulfilled you will be able to unlock new buildings and military units. Roads are important to speed up the delivery of materials and building upgrades increase productivity. Expansion is done by conquering new sectors of the map – these sectors may also have resources you don’t have in the one you started in. This will mean a big part of the economy will be scattered throughout several sectors and need to be kept safe from enemy raids. Let’s take a look at some topics in detail. When starting you always have your store house, church and castle directly connected to the marketplace. 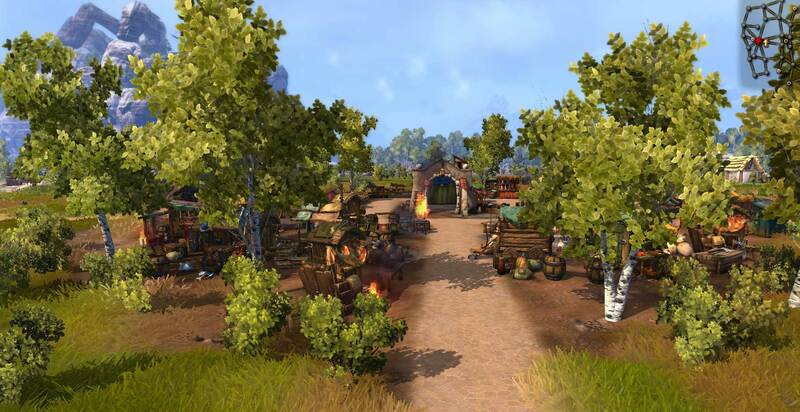 The first thing to do is to place two woodcutters to secure sufficient buildings materials and either hunters or fishers for basic food supply. Your workers will deliver the raw products to the store house, but fish and meat will have to be turned into smoked fish and sausages before they can be consumed by the settlers. Check the map for symbols for each resource to find out what you can produce in your first sector. With basic food supply taken care of, it’s time to tackle the next of your people’s needs: hygiene. For this you will have to either place a soap maker (who uses the same resource as the butcher) or a broom maker who needs wood. You can of course also place both types of buildings depending on what kind of –and how many – resources are available. After this you should keep an eye out for stone and iron as well as more building space: time to explore. Select your hero and send him or her to one of the nearby sectors. As soon as you enter it the map will be revealed and you can see what kind of opportunities the sector offers. If you found what you were looking for, place a tower via the menu in the bottom right corner (while having selected your hero). Make sure to connect this tower (and generally all buildings) with streets for faster transport. When you got your basic settlement set up and explored a sector or two for further expansion, it’s time to focus on your heroes. Not only are they a lot stronger than your average soldier, each of them also has a special ability: Elias the trader for example can provide additional food while Alandra can cure sick settlers. You also need your hero for various interactions in the world itself. Be it to be able to build towers to conquer new sectors, interact with AI players for certain missions or to investigate ruins, mines and similar places on the map. To unlock more buildings and units you will have to promote your hero which means granting him a new title. For this you will have to click on the button just above the minimap. There you’ll see which requirements the new title has, e.g. a certain amount of settlers, your castle at a specific level and a sufficient amount of a certain good. 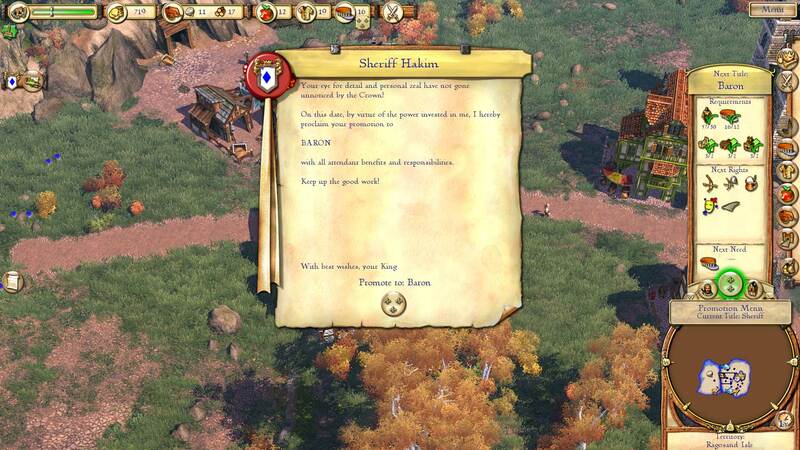 If you fulfil them you can then click the appropriate button and your hero as well as your settlers are happy. 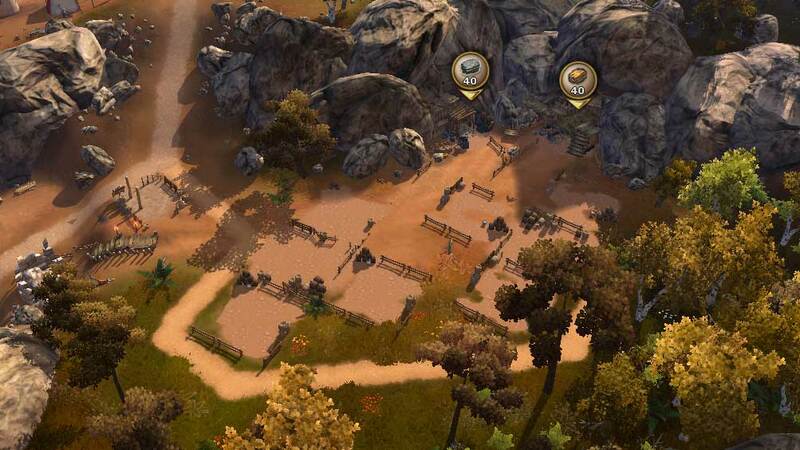 Since each title gives you access to new buildings and products, it is vital to focus on these requirements right from the start to at least progress fast enough to be able to build walls and recruit soldiers. Not only will new buildings improve your possibilities and production capabilities, one very important gameplay mechanic are building upgrades. These will not only allow an additional worker to move in (and therefore increase your productivity), higher building levels also unlock carts, allowing your settlers to transport their goods faster. If you combine this with a good road network and upgrade your basic paths to roads later, you make sure all resources reach the city in time for further processing. Be it delicious bread, comfortable clothes or swords for your army. When building your city and all your production buildings it’s important to keep an eye on the landscape. Make sure you use all available space and place related buildings close to each other. Since you will want to build a wall around your core city later, make sure to choose the right places for it. 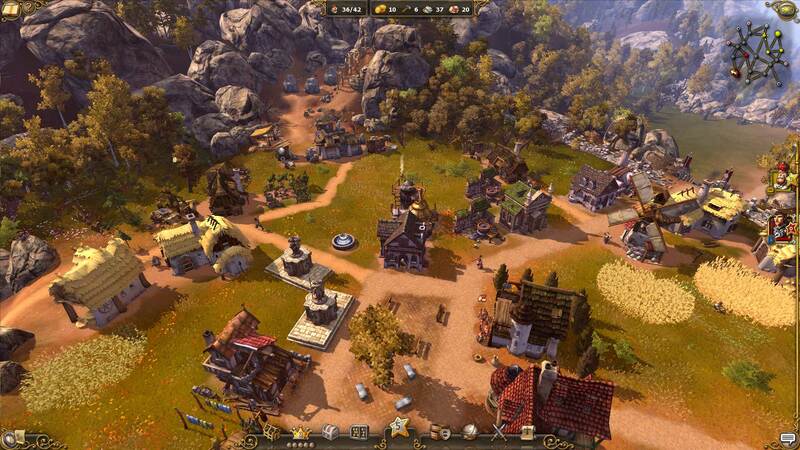 And talking about right places: The Settlers – Rise of an Empire features different seasons. In winter you won’t be able to harvest any honey or wheat – and rivers freeze and can be walked on. Make sure to not rely on rivers as border protection too much, depending on the map you’re playing. And since we’re already at it: The military. 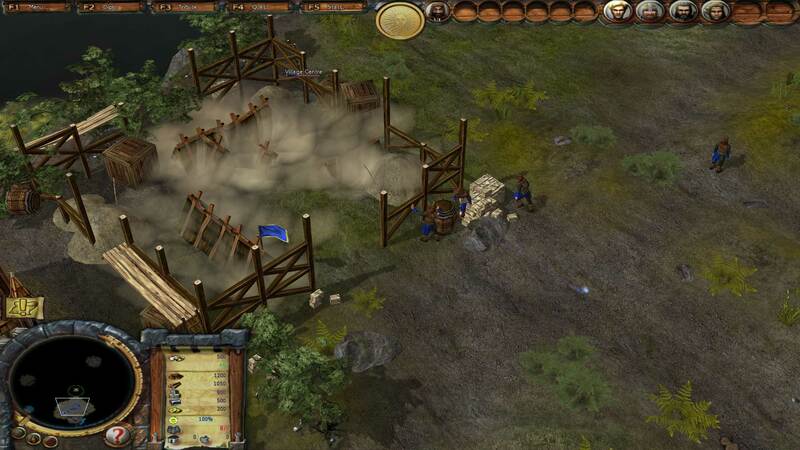 You can build swordsmen and archers in their respective barracks as well as three different kinds of siege engines. The latter need to be manned with one group of soldiers to work. Keep in mind you may have to first get a new title for your hero to access the respective building. The higher your city’s reputation (top left corner), the higher your soldiers’ combat power. If it drops too far or one of your main buildings (castle, church, store house) gets destroyed, you lose the game. 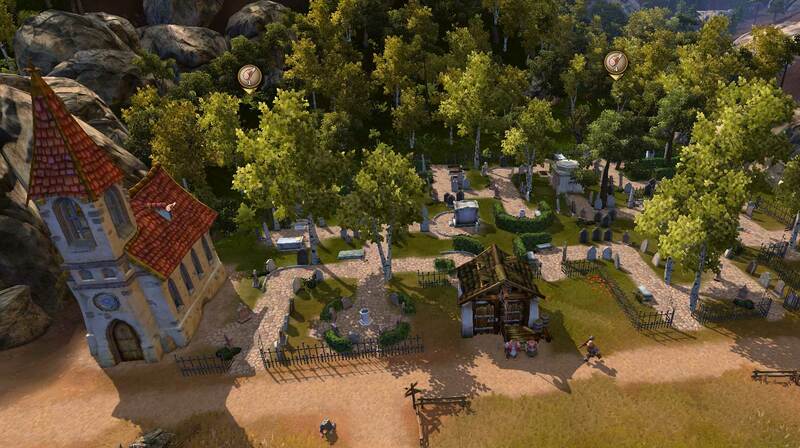 To increase your reputation, upgrade your main buildings, offer your settlers different kinds of clothes, food and decorative objects and provide them with special activities like festivals, church sermons and rare commodities like salt or dyes. Enemy attacks, a lack of food or a high tax have a negative impact on your reputation. 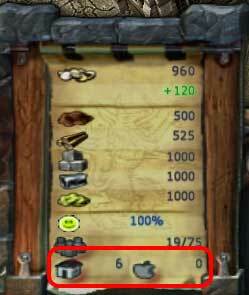 Therefore, try to have enough goods in store to satisfy your settlers’ needs and get your hands on some rare goods via trading. If this is just too much theory for you and you want to practise a bit more, go and play the singleplayer campaign of The Settlers 6 which doubles as a tutorial. There you’ll be slowly introduced to all important game mechanics. Do you have any tips you might want to share with your fellow players? 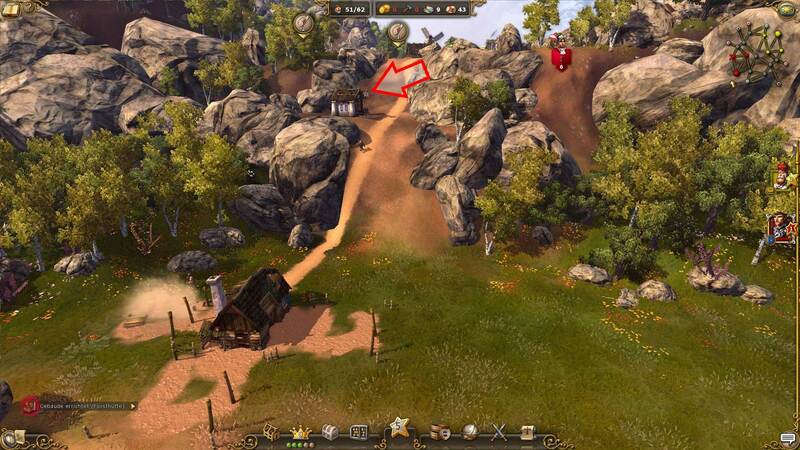 Or are you new to The Settlers 6 and have questions or need advice? Are you maybe looking for a multiplayer match? Feel free to discuss it in the comments. In the previous dev blogs we talked about food system and how your residents take care of your workers. Veterans of the series might have asked themselves if houses have a different function, how do we get new settlers? 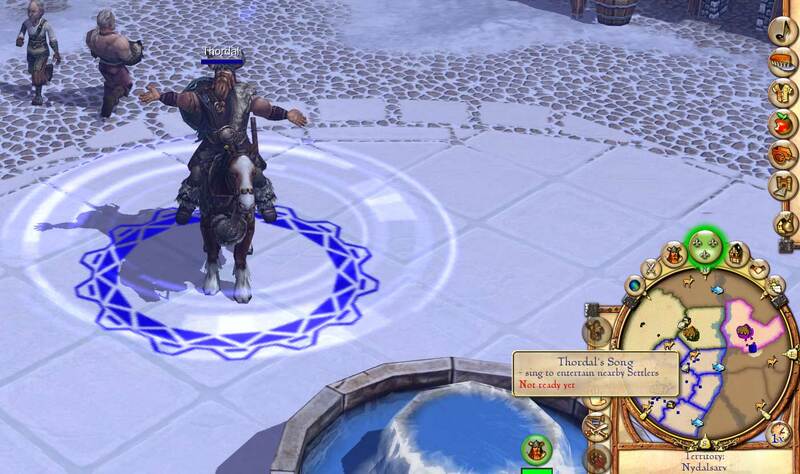 Well, we answer this question in this week’s dev blog. We’ll talk about the “Harbor & Population System” and everything that is connected with it. In the new The Settlers we have different types of settlers. Our workers with the blue shirts take care of constructing, gathering resources and processing materials. We also have the carriers, the girls and guys with the white shirts, transporting goods from A to B – our busy bees. In order to get new carriers we will need to build a harbor. This is done at the shoreline. In the first stage the harbor requires softwood logs as construction material. 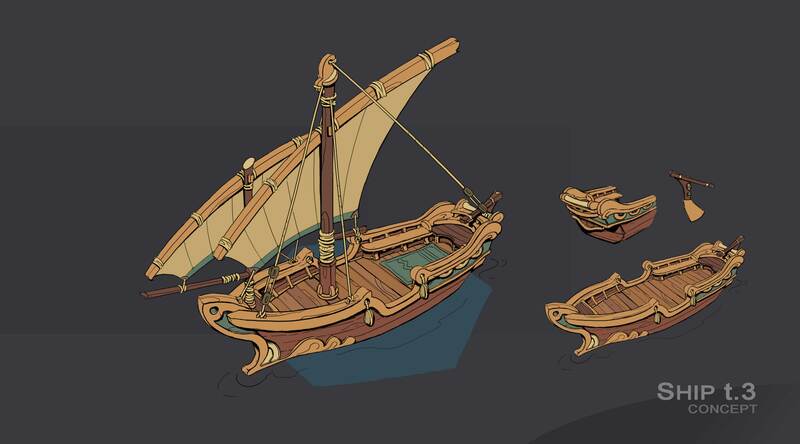 Once the building has been constructed the harbormaster enters his small little skiff and leaves the island to unseen shores to convince other settlers to join our settlement. As the boat is rather small only a handful of new settlers might join us. While new settlers arrive as carriers on our island, those can be educated and trained to take different roles later. The waters are rough and we need to make sure our settlers arrive safely. Our harbormaster is not only tasked to bring new settlers to our island, he / she will use hardwood logs to repair the boat as well. While it is easy to attract new settlers to an adventurous new settlement on an unexplored island, it becomes harder when we already have a higher population level. We can increase the chances of people joining our settlement, if we support that idea with some coins. So, it is time to construct a coin maker / mint. In the first stage, we can use copper ore to produce copper coins, but we decided to upgrade our mint and use silver ore to produce better coins. If we offer higher valued coins, the chances will be higher to convince others. 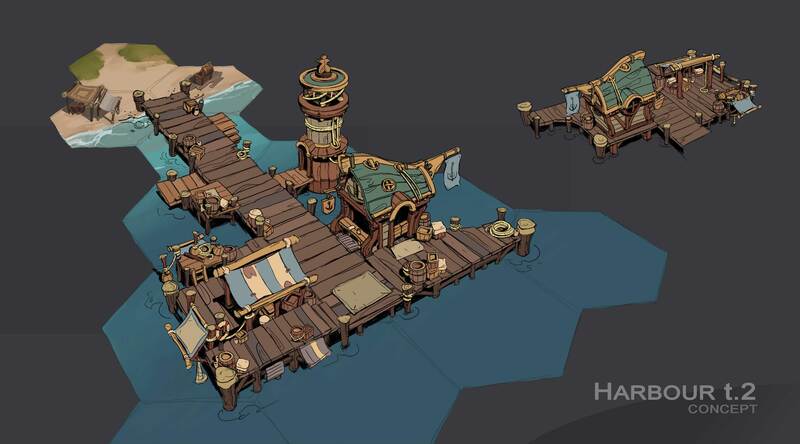 Upgrading your harbor should be also a priority. We will not only get better boats, which can load more people, we also have more workers to help loading and repairing them. If we have space for it, we can build multiple harbors and get new settlers faster. The requirements stay the same. 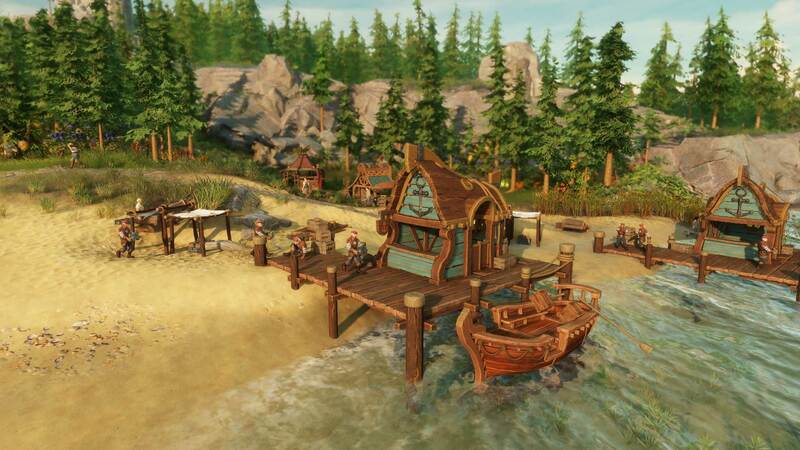 If we already have a high number of settlers in our settlement we will need to provide gold coins to ensure the boats are returning with full load. With a simple option we can decide (by turning the building on / off) in which harbor(s) the helpers arrive and we can also choose which coin types the harbor should use to attract people. 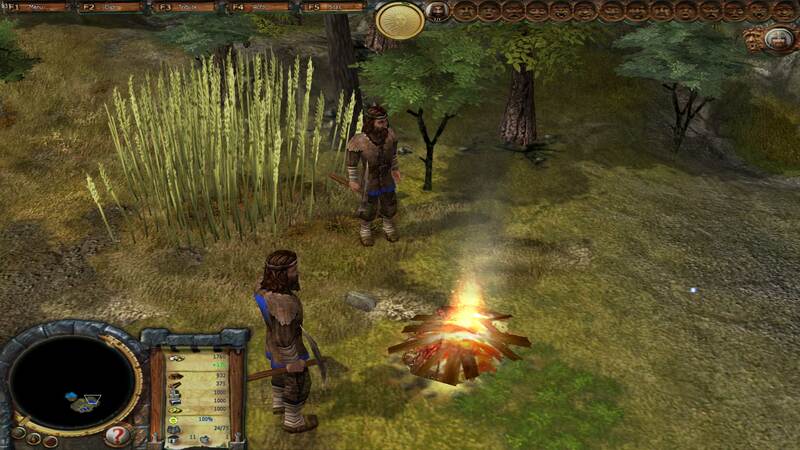 The game will also offer other methods to gain new settlers, but it is too early to reveal them yet. What do you think about the concept art? Do you like the harbor and the population system? Let us know what you think it in the comments below. 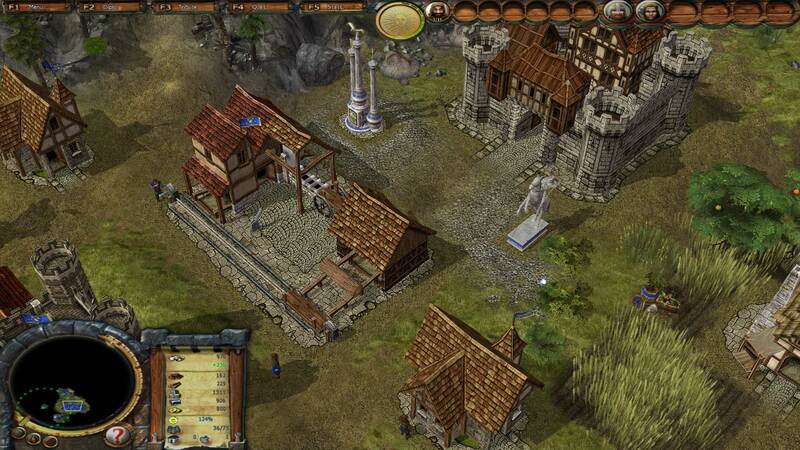 Following the previous guides, today we would like to introduce you to Dario’s world in The Settlers 5. 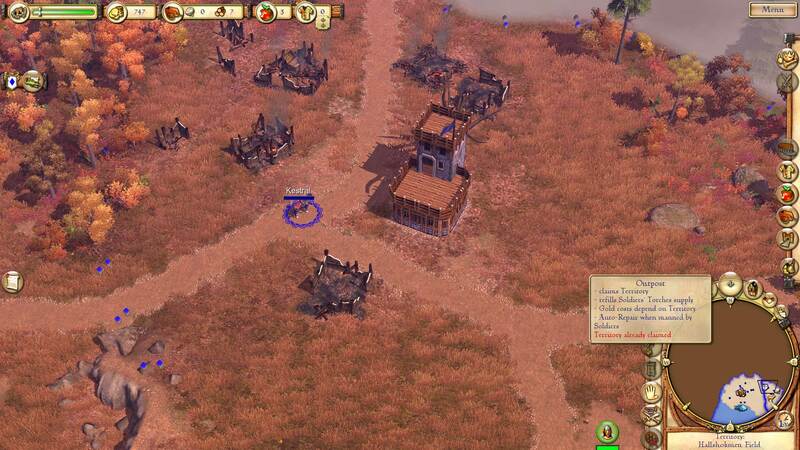 The Settlers 5 uses a direct control system for the units, like in a real-time strategy game. The goods cycles are not visible directly in the world. Instead, all goods automatically land in a total stock and can additionally be duplicated by so-called refiners. 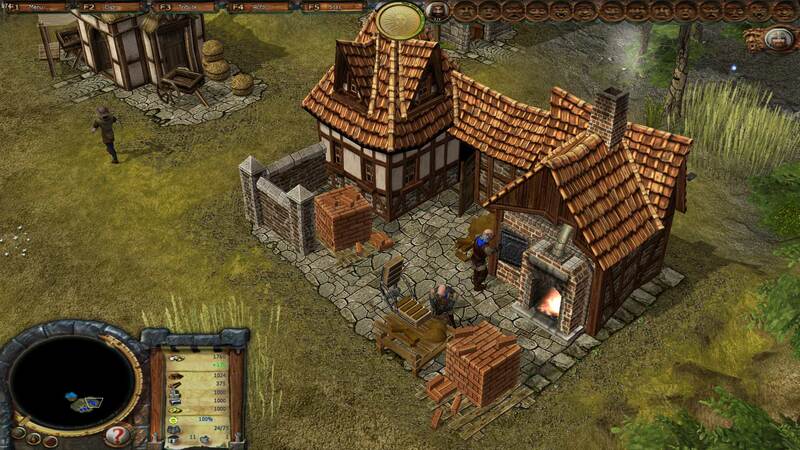 In The Settlers 5, there is no “real” AI that builds its own houses or cities. 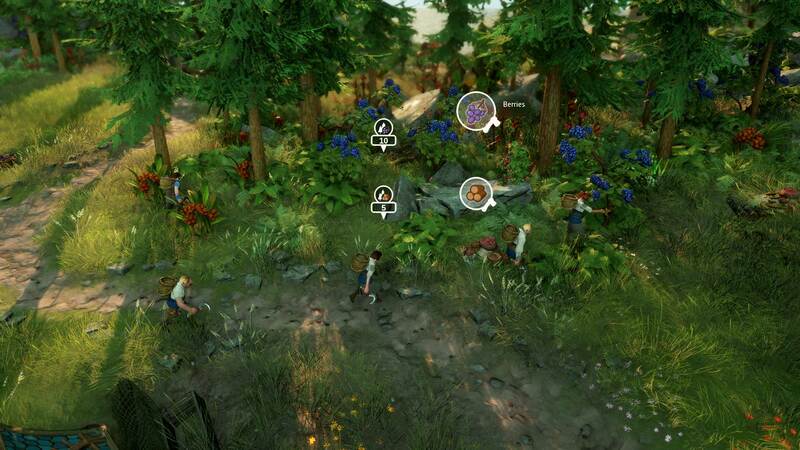 Instead, you are dealing with scripted, recurring hordes of enemies. Therefore, on pure multiplayer maps you remain alone in the single player mode. Below is a brief introduction to building your first settlement on a single player map. To start, click on a serf and give him tasks. On many maps it is first necessary to build your village center. In order to do this, select the serf, click on the flag in the build menu and then on the existing “site” on the map to build your village center there. You can also assign several serfs to each construction site to speed things up. 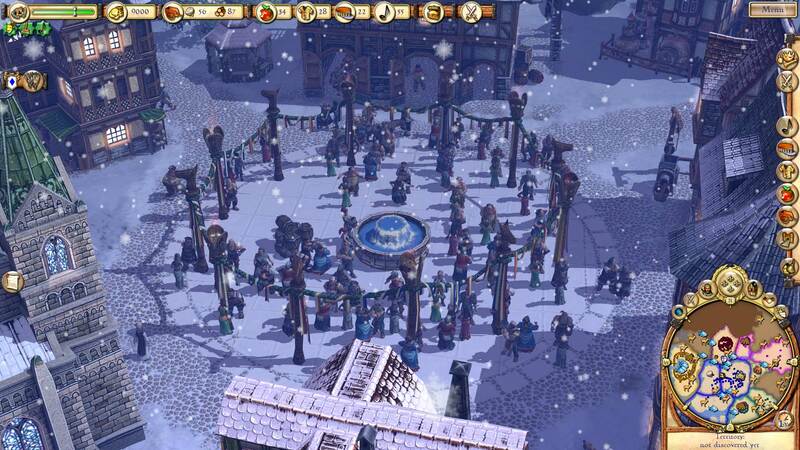 After building the village center, you can now start collecting resources. Your serfs can mine the basic resources such as wood. Other resources, such as clay and stone, exist on the one hand as simple deposits which your serfs can mine, but also in the form of large stone/clay/… shafts and quarries. On those you can build pits which are extracting resources much faster than your serfs would do. Now take a handful of serfs and send them to nearby trees as well as stone and clay deposits. You can hire additional serfs in the castle (hand symbol). 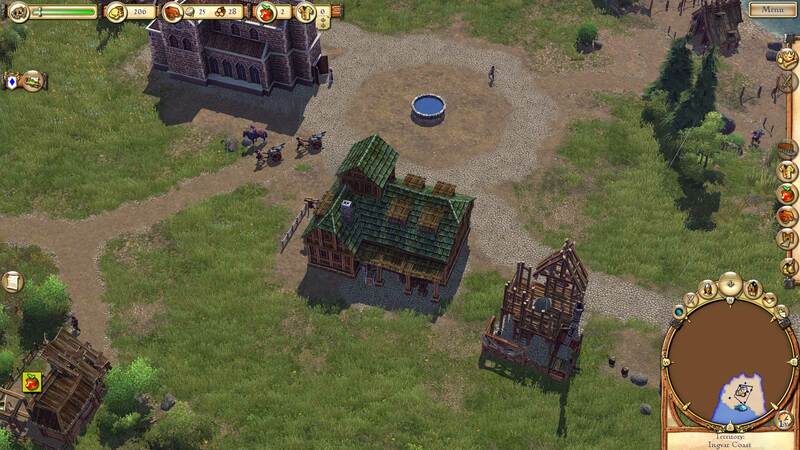 Tip: In contrast to most other RTS games, the serfs do not have to bring the resources to the village center. Therefore, it does not matter how far from the center you send them! The same applies to the pits. The Settlers 5 is based on the construction of many mini-cycles. Every worker needs a residence for sleeping and a farm for eating. Each residence and farm provides enough for several craftsmen. Therefore, to continue, build a hut and a farm in a free space. Important notice: The farmer also needs something to eat, of course, and a place to sleep. Thus, in both buildings the farmer already occupies one place from the beginning. Now build a university next to the residence and the farm. This is the most important building at the beginning, because there you can research all other building options. This information shows the missing places to sleep and eat in your settlement. As you can see, the university already needs more sleeping space than a single hut can offer you. Nevertheless, you can ignore this at the beginning – the research takes only a little longer. Workers without sleeping quarters spend the night around the campfire and are less efficient. 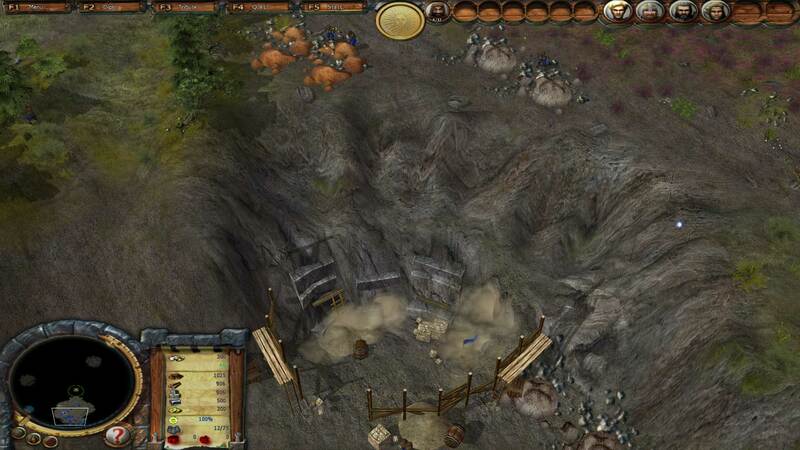 If you have found a stone quarry and a clay shaft, build one residence and one farm next to each. After that, construct pits on both of. Consider that a farm offers more space for workers than a hut does and keep in mind you can upgrade buildings later on. The next step is the “processing” of resources. 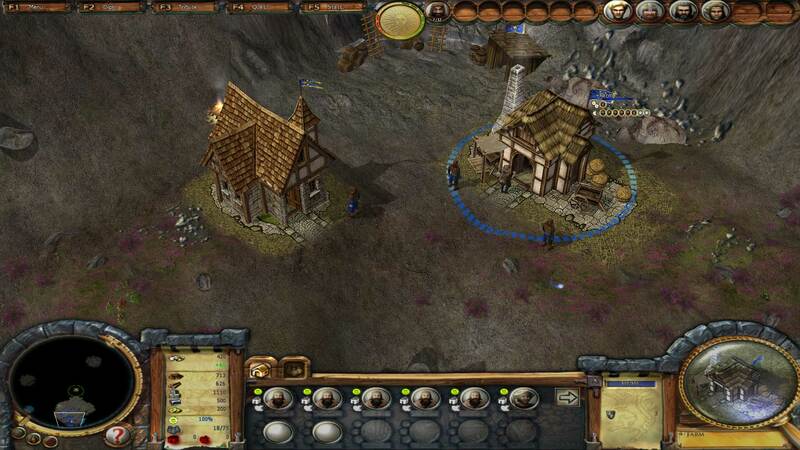 You can refine your wares in The Settlers 5, which simply multiplies them. Therefore, the construction of a sawmill is especially important – because unlike clay and stone you cannot mine wood with the help of a pit! Build a sawmill with a residence and a farm nearby close to your castle. The craftsmen working here are the first to get their goods from somewhere else. However, not as perhaps expected from the lumberjacks, but from your total stock. Therefore, the craftsmen take the goods directly from the castle (and later also from warehouses/marketplaces). As your game progresses, you can research improvements for your fighters at the sawmill too (after it has been upgraded). Principally, you can upgrade all the buildings in the game to unlock additional options or to offer more space. The upgrades will be particularly important for huts and farms later in the game. Thus, you have now built your first small settlement. 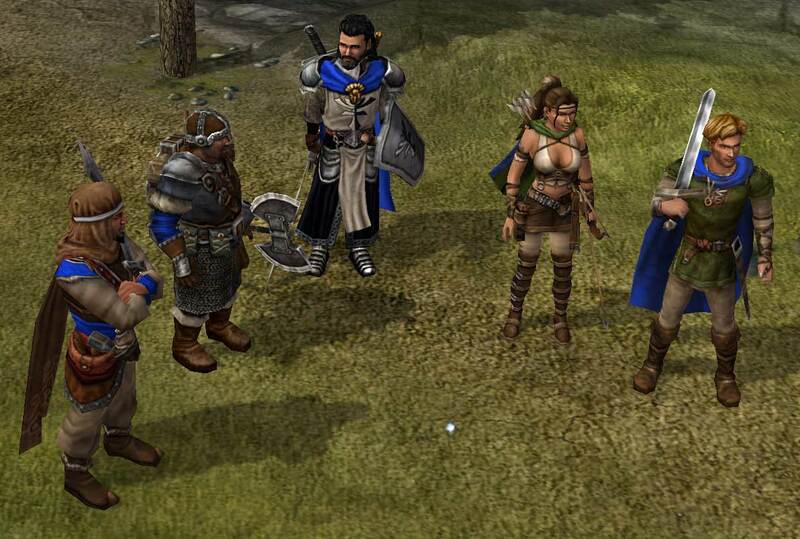 A very important role in The Settlers 5 take the playable characters. They all have special abilities that can often determine the outcome of a battle. Dario, for example, can use his falcon to explore the map. After sending the bird, you can turn on a special perspective to see the world from the hawk’s eyes. In addition, Dario has another ability to scare his enemies and to drive them back for a short time. You should always focus on the construction of refiners, which are – in addition to the sawmill – the brick maker’s hut, stonemason’s hut and later also the smithy and the alchemist hut. Always build these buildings close to the castle or next to previously built warehouses to keep the walkways short. Opponent hordes will attack you repeatedly until you destroy their camps. 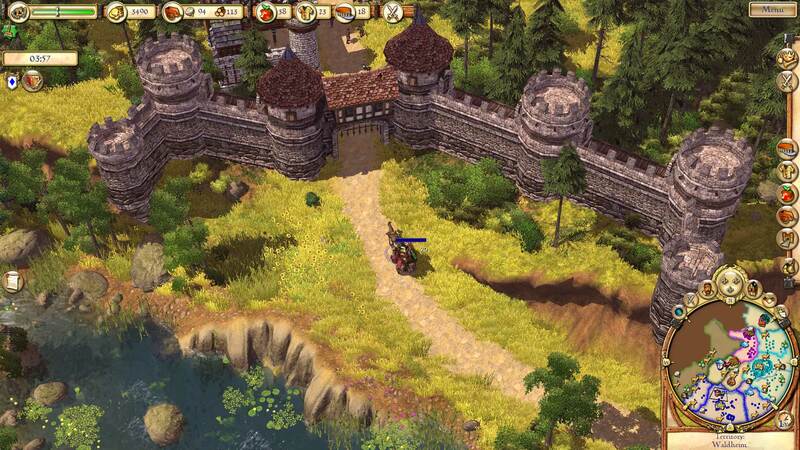 Therefore you need a working defense using both towers and soldiers right from the beginning. Thank you to haep for writing this great guide! Do you have any more tips to share? Secret strategies? Or maybe a guide for the singleplayer campaign, be it a video or in written form? Share it in the comments to help the people new to the game!